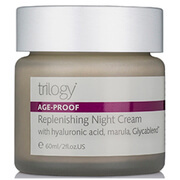 trilogy AGE-PROOF Replenishing Night Cream 60ml is a replenishing and rejuvenating night cream. Containing a potent blend of nourishing bio-actives, including Coenzyme Q10, Hyaluronic Acid, Marula and Glycablend, trilogy AGE-PROOF Replenishing Night Cream helps to restore elasticity and suppleness while smoothing fine lines and wrinkles. With a light and relaxing fragrance, the night cream is easily-absorbed and deeply nourishes and repairs while you sleep, by assisting the skin's natural process of regeneration. trilogy AGE-PROOF Replenishing Night Cream with hyaluronic acid, marula, Glycablend 60ml was found on 4 websites and was price compared using EAN: 9421017761011. The cheapest trilogy AGE-PROOF Replenishing Night Cream with hyaluronic acid, marula, Glycablend 60ml is shown as the main item, prices range from £29.25 to £32.50, excluding delivery. Price comparison based on price and delivery charges, with any valid discount codes being applied, is shown in the table above. Prices and information correct at the time of publication.